Seth Pruzansky has been bottling and selling “raw water” — that is, water straight from spring to bottle without filtration or treatment — for nearly a decade in Maine without issue. But a recent article published by The New York Times plunged him and his business, Tourmaline Springs, into stormy waters. The article documented how so-called raw water — once a fringe product supposedly brimming with beneficial bacteria and minerals from deep within the earth — is now gaining millions of dollars in funding and influential supporters from Silicon Valley. The result is unfortunate, but predictable: $35 jugs of unfiltered water being sold at specialty grocery stores in San Francisco. People are mocking this “Raw Water” guy but getting Silicon Valley millionaires to drink $50 bacteria-laden puddle water because they’re scared to drink the same tap water as poor people merits some kind of Guggenheim fellowship. As a raw water pioneer, Pruzansky is dumbfounded by the outrage. And so, we recently sat down with him to hear his side of the story. What do you make of raw water coming under scrutiny? I’ll start by saying this: Everyone here in Maine is laughing their asses off. They think it’s the funniest thing ever, because everyone here drinks untreated water out of a well — even the state regulators. This is a testament to how disconnected human beings have become from the natural world, to the degree that they trust human processing, machines and influence more than they do nature. Which in many ways is a discussion that lacks common sense, because nature is the reason for everything — it’s the reason for the seasons. That’s not to discredit [the scrutiny], because obviously we want to drink water that’s safe. I’ve never advocated drinking water out of a stream, which is another thing: The mainstream media doesn’t seem to know the difference between a spring and a stream — they call it the same stuff. Drinking out of a stream can be very dangerous for apparent (and obvious) reasons. This brings me to another disconnect from nature: We’re so disconnected from nature that most people have no idea what a natural spring is. There’s this major educational hurdle that [Tourmaline Springs] are trying to overcome, and having these monster organizations try to tear us apart and bash us is again a testament to how disconnected from nature our species has become. I’ve been getting death threats, and you wouldn’t believe the things people say. It’s mind-blowing. Okay, let’s settle this then: What is the difference between spring water and stream water? A real spring is formed in an aquifer deep under the ground from a time before human contaminants and pollutants. The water isn’t just sitting under the ground — it’s going through a purification process made by Mother Nature that purifies the water to a degree that no human machine is capable of replicating. I’m able to say that because our water-testing analysis demonstrates the unwavering purity of this water. It’s not just some great idea we’re using for marketing, this is quantifiable: We’ve tested our water with the most comprehensive 50-state compliant water analysis testing there is for almost 14 years. There used to be natural springs all over the world — they were everywhere. The United States had tons of them. In Europe, they still don’t treat a lot of the spring water. If they do treat it, they have to label it. In Germany, for instance, it’s illegal to treat water without labeling it as treated. What we have is one of the most historic springs in the United States. We have documentation of our spring providing water to the area before Maine was even a state — it was still Massachusetts. The water was sold as a “healing tonic” in the early 1900s in New York City for what would be the equivalent of $100 per gallon in today’s prices (it was 40 cents per gallon then). 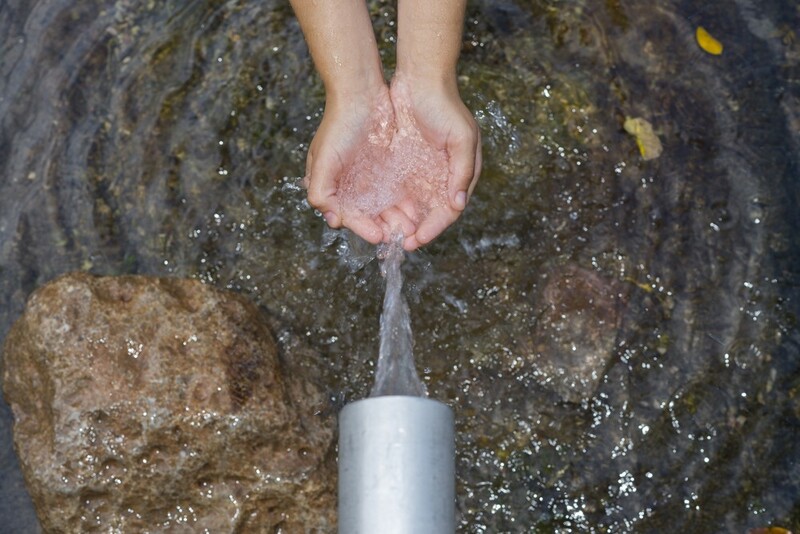 What do you think makes raw water preferable to tap water? It’s more about what’s not in this water than what’s in it. When the water is sitting in these aquifers, particulate matter, impurities and contaminants kind of falls to the bottom. When the aquifer is pressurized, it rises up through layers of earth. As it comes through these layers of earth, it’s filtered through bedrock, soil, sand — all these things that filter it. What emerges out of the surface of the earth in the case of our spring — sadly it’s not like this for most springs anymore — is something that’s so pure that it even has a low mineral content, which baffles the local hydrogeologist, because it’s a very mineralized area that this comes up through. That’s what a natural spring is: It’s Mother Nature’s own filtration process that refines and purifies the water, so that by the time it comes out on the earth’s surface it’s so pure that you can drink it without treating it. You’ve been drinking raw water for your entire life. Have you had any problems? I take my health very seriously. I’m in top physical shape, but not just physical — mental and emotional, too. I work on really being a good example for my kid and for other people’s kids. These children are going to inherit this planet, and most of the adults that I know aren’t leading as very good examples. Do you ever drink mainstream bottled water? Well, yeah. I’m not religious about it. I’m a real human being living in today’s industrialized, modernized world. Do you notice a difference between bottled water and raw water? To me, it’s a night-and-day difference. But that’s partly because I’m so aware of the difference, and I’ve studied it. Look, it all comes down to this: People think water is just water, but when you drink truly pure water — compared to water that isn’t as pure — you can taste the minerals. Some waters almost have a salty aftertaste. You don’t taste it necessarily when you’re drinking it, but all of a sudden there’s an aftertaste. What does the future hold for raw water? I’m an entrepreneur who has enough foresight to realize that the business decisions I make are going to affect future generations. Therefore, I’m willing to make very little profit in order to create structures that improve the state of the world. Obviously they’re far from perfect, because we’re working within the systems in place to try to make a better way. But we’re still subjected to the same market forces that are really creating a lot of destruction in the world — a lot of pollution and a lot of toxicity. In regards to water, I want to say this: We’ve been given this idea that nature is dirty, like it’s going to make you sick. Stop and think about how crazy that is and how that lacks common sense. Mind you, there are always distinctions: You’re not going to want to drink out of a stream, river or pond. All of those will make you sick. But water that’s coming out of the ground, that’s been tested and that’s offered by a company that’s been doing this for 140-plus years is a different story. Anyhow, I just hope that we can realize that we all exist because of nature, and at some point, we have to stop being completely influenced by mainstream media and corporate businesses, and start creating structures that are more in alignment with nature. Can we keep going? Is this going to be fair to hand off to our kids? I don’t think so, and lots of other people don’t as well.